means Capricorn Campers of Rose Cottage, The Street, Swanton Abbott, Norwich, NR10 5DU. means the person or persons nominated as the hirer under the heading 'Hires Name / Contact' on the Rental Agreement and any person whose credit card is presented in payment of the customer's charges. means the period as stated on the Rental Agreement or any agreed variation thereof and any additional period during which the vehicle is in the customer's possession or control. 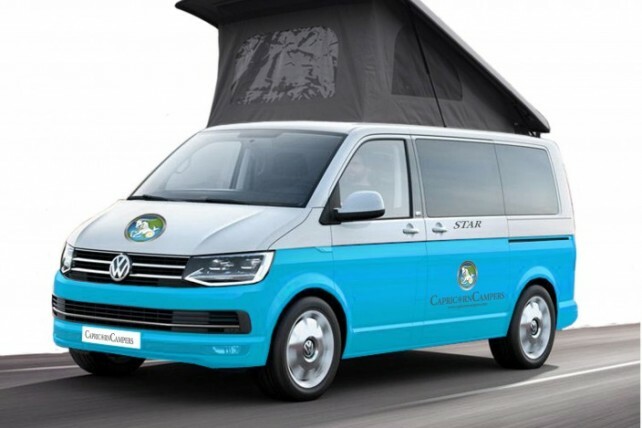 means the vehicle as stated on the Rental Agreement and includes tyres, tools, accessories, the living equipment and any other special equipment, documents related to the Vehicle and any replacement or substitute Vehicle which may be provided by Capricorn Campers. means the amount held as security by Capricorn Campers in relation to this hire. Capricorn Campers will refund the security deposit within 7 working days of the date the campervan is returned back to Capricorn Campers. Should any damages exceed the security deposit the customer will be responsible to settle all additional costs over and above the security deposit value. In the event of any discrepancy between these Terms and Conditions and any other Capricorn Campers literature, the provisions of these Terms and Conditions apply. Booked and paid for in full by hirer at time of booking on www.capricorncampers.com as per Rental Agreement. Payment is only accepted by credit or debit cards (Visa or MasterCard only). Vehicles will not be released without valid personal identification and funds for deposits being available on collection. The vehicle will not be released until deposit is paid. 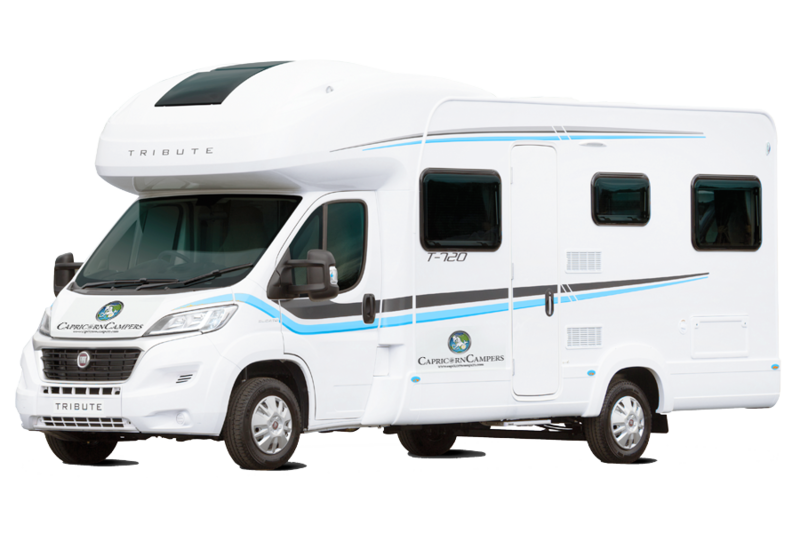 Capricorn Campers requires site of a full driving licence along with two forms of acceptable proof of current address dated within 60 days prior to start of hire for all named drivers. *Insurance loading. In some cases, Capricorn Campers will incur additional charges if the driver to be insured has a traffic conviction, is using a non-UK driving license or is in an occupation which is deemed high risk. These charges will be passed onto the customer. 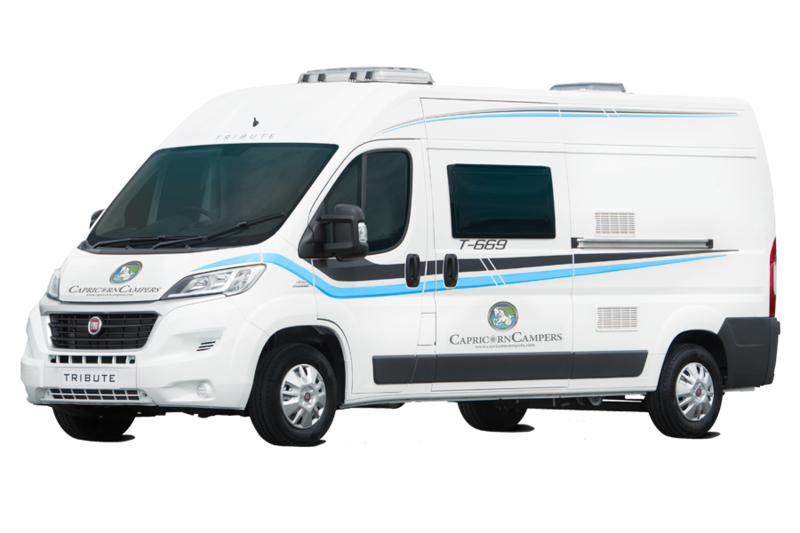 **Capricorn Campers will supply full breakdown cover to cover any mechanical faults to the base chassis of the vehicle. Any call out charges necessitated by the customer through operator error, e.g. a flat vehicle battery, wrong or insufficient fuel, keys locked in vehicle etc will be the responsibility of the customer. ‘Hire Period' means the period as stated on the Rental Agreement or any agreed variation thereof and any additional period during which the vehicle is in the customer's possession or control. Rental is charged on a calendar day basis, Minimum rental is from 4 days to 7 days depending on the season. Capricorn Campers reserves the right to increase the minimum hire period for certain events. Collection is strictly from 9am and return is strictly by 4pm, charges apply for late returns. Out of hours collection and return service is available by prior agreement. Collection and return location is to be agreed at time of booking. All drivers must be present at check-in and checkout. No exceptions can be made. Production of a full, valid standard driver’s license along with two forms of acceptable proof of current address dated within the last 60 days prior to hire date is required from all drivers at the start of hire. An online licence check must be completed with the DVLA prior to hire. Should the drivers fail to present all correct documentation and identification on collection of the vehicle then Capricorn Campers will be unable to release the vehicle and no refunds can be given. Capricorn Campers may not be able to get cover for any driver with more than 6 points on the license in the past 3 years. Please contact the office to verify if cover can be arranged. Drivers are personally liable for all legal penalties (e.g. parking tickets, congestion charges, speeding fines) which are incurred amd must ensure the maximum number of travel passengers and maximum permissible weight of the vehicle is not exceeded during the period of hire. Details of the one additional driver (if applicable) must also be provided on collection of the vehicle. Maximum of 2 drivers per rental. Hirers under 25 or over 75 years, (76 to 79 years of age can be agreed with prior approval from our Insurer). Hirers aged 25 or over unless a full valid UK/EU driving license has been held for 24 months. Persons who have been convicted of an offence in connection with the driving of a motor vehicle or motorcycle and/or have had their driving license endorsed or suspended or penalty points imposed. Parking and not more than two seperate three point speeding offences in the past 3 years may be ignored. “Spent” convictions, covered by the Rehabilitation of Offenders Act 1974 may be disregarded. Certain situations can be agreed with prior approval from our Insurer. Persons who have had their license revoked by DVLA due to medical grounds or convictions. Additional insurance charges may apply if the hirer has an occupation that is deemed to be high risk. The Vehicle is insured for damage to the Vehicle and the property of a third party; but does not include any personal insurance for the customer (including death or bodily injury to the driver) or cover any personal possessions. The vehicle insurance is provided by LV Ltd. The hire rate quoted includes a standard excess of £750.00 per incident whilst in the UK and £1,000 whilst in Europe for UK licence holders. An additional excess is applied of £250 for non UK licence holders and for festivals and sports events. In the event of any damage to either the vehicle or third party property, the hirer will be liable for the first excess. The hirer will also be fully liable for all overhead damage*, any damaged deemed as gross negligence and replacement or repair of windows and windscreens or tyre damage. *Overhead damage is deemed as any damage to any part of the vehicle which occurs above 6 feet (1.83 meters) and or any third party property. Driving by an unauthorised driver invalidates insurance. It is a criminal offence to drive without insurance in the UK and Ireland punishable by law. Failure to declare an accident is a criminal offence punishable by law. The theft of a Capricorn Campers vehicle will not be covered by insurance if the ignition keys are left in or on the vehicle whilst unoccupied and the hirer shall be held fully responsible for a replacement vehicle. Insurance does not cover or include the hirers’ personal belongings. No other hire insurance is acceptable for the rental of a Capricorn Campers vehicle. Points on license: Drivers with between 4 and 6 points incur an additional insurance cost of £5 per day. Convictions with the following codes may not get cover AC, BA, CD, DD, DR, MS, TT, UT and IN. Please check with Capricorn Campers if you wish to insure a driver who has any of these endorsement codes on their license even if you think they have expired. “Special Cover” Package can be purchased to cover windscreen, wing mirror or tyre damage. See website for current price. The COLLISION DAMAGE WAIVER (CDW) is an optional insurance charge that reduces the insurance excess. This can be purchased at time of booking online or on collection of your vehicle. License holders from outside the UK and for festivals and sports events have an additional excess of £250, which cannot be reduced and no CDW is available. Our UK excess reduction costs £10.00 per day will reduce the £750.00 excess per incident for damage caused due to a collision (i.e. reported accident) to either the vehicle or third party property to £375.00. We also offer excess reduction for European use, reducing the excess from £1,000.00 to £500.00 per incident for £15.00 per day. The hirer will however be fully liable for any overhead damage, replacement or repair to windows and windscreen, tyre damage or damage costs caused through gross negligence. Windscreen and tyre replacement insurance is available for £5.00 per day. Excess applies in respect of each incident and or claim, not each rental. If CDW is taken, it must be for the whole rental. Should the Terms and Conditions not be adhered to, the CDW will be void and the customer will be liable in full for all costs and damages. Please note that the CDW is completely optional and can be decided upon collection of your vehicle. After the hire has commenced, CDW cannot be taken out. Excess reduction cannot be taken by non UK license holders or when the vehicle is attending a festival or sporting event. Collection and return of the vehicle will be at the agreed location specified at the time of booking as set out in the ‘hire period’ in the rental agreement. Additional fees for pick-up drop off locations and one way relocation fees are stated on the website. Collection: From 9am to 4pm, please allow 1 hour for the hand-over to complete the documentation and demonstrate your vehicle to you. On site parking is provided for 1 car for the duration of hire (Norwich NR11 6TQ location only). Cars and any belongings left inside the vehicle are left entirely at the owners risk and Capricorn Campers can not take any responsibility. Return: From 9am to 4pm. The vehicle must be returned on the date, and before the time stated, on the rental agreement. There are no refunds for early returns. Vehicles must be returned clean and in the same condition as they left the depot, otherwise a charge will be made for excessive valeting and or upholstery cleaning. In the case of gross negligence Capricorn Campers reserves the right to recover full costs in order to return the vehicle to the state in which it was handed over. Late return: If you will be late returning, Capricorn Campers must be advised immediately. Failure to advise may result in prosecution for driving whilst uninsured. An additional charge of £25.00 per hour will be payable for all late returns, late return exceeding 2 hours will be charged at one day’s rental cost regardless of the circumstances. The hirer will also be responsible for any direct costs attributable to their late return, e.g. lost hire for the next hirer. Out of hours collection and return service is available by prior agreement. Credit card and debit card charges are non refundable. Cancellation administration fee of £45 will be charged. Capricorn Campers reserve the right to refuse to hire to any person, without stating cause. Every effort will be made by Capricorn Campers to ensure you receive the campervan type ordered. However, Capricorn Campers reserves the right to change your campervan type in the event of an operational issue. A full refund will be offered if the alternative campervan is not acceptable. There is a refundable £750.00 Security Deposit (£1,000 for EU travel) payable by credit card or debit card, the amount will be debited from your account immediately. This is fully refundable within seven days of return of the vehicle to the agreed location, on the agreed date and time, in the same condition as it was let out, with the toilet and grey water tank empty, the interior clean including all cooking appliances and the fuel tank along with the LPG gas tank full. Capricorn Campers reserves the right to increase the security deposit for licence endorsements and specific events e.g. Major football events and Festivals as determined by the insurers. This security deposit will be used to fund any loss or damage what so ever to equipment, fixtures, fittings, windows, tyres or negligent damage to the vehicle. The hirer agrees to pay Capricorn Campers any additional costs over and above the security deposit value should damages exceed the security deposit value. A cleaning fee of £50 will be charged against the deposit if the vehicle is not returned with the interior in a clean condition or smoking in the vehicle. An additional fee of £25 will be charged against the deposit if the toilet and waste tank are not emptied prior to the return of the vehicle. Please note there are no toilet cleaning facilities at any of Capricorn Campers depots so toilets and waste tanks must be cleaned prior to returning the campervan. European insurance is mandatory and you will be in breach of these terms and conditions should you take a vehicle into Europe without prior notice. Other hirable extras available for the duration of hirers’ stay in a Capricorn Camper are listed on our website. Alternatively, please contact our office for full details. We accept Visa and MasterCard debit or credit cards only. Who is not authorised by law to drive the Vehicle. Particulars of a proposed licensed driver of the Vehicle are set out under the heading 'Hire’s name/ contact’ on the Rental Agreement. n) Driven on any road surfaces other than on sealed / bitumen roads or suitable caravan sites. Capricorn Campers will carry out a full Pre Checkout Inspection (PCI) on every vehicle before the commencement of hire. The PCI involves testing every system on board the vehicle to ensure they are operating correctly. In conjunction with this the hirer will be taken on a tour of the vehicle and shown how each system works. Should an onboard system fail during your hire, Capricorn Campers will make every effort to remedy the fault whilst you are away but in some circumstances this may not be possible and Capricorn Campers cannot be held responsible and will not refund any monies should a loss of service be encountered. No alterations or additions to the Vehicle should be made without the prior written consent of Capricorn Campers. Driver(s) are personally liable for all legal penalties and fees pertaining to any traffic violation infringements under the current Road Traffic Legislation applicable in the United Kingdom and Europe. Capricorn Campers will contact the customer after the rental agreement finishes if any traffic violation infringements are presented to Capricorn Campers for your hire period. The driver(s) will be liable for any penalties and fees pertaining to any traffic violation that has been incurred during their hire period. Capricorn Campers will notify the driver(s) of any speeding or parking fines and an administration charge of £40 for each infringement incurred throughout the hire period. a) In the event of any accident, loss or damage arising out of the use of the vehicle, the hirer must notify Capricorn Campers within 24hrs of the happening of the event, ideally immediately the accident occurs.No responsibility can be accepted by Capricorn Campers for any loss or damage or expense which occurs as a result of any accident. Assist Capricorn Campers in handling any claim arising from any event, including providing all relevant information and attending Court to give evidence. b) The excess or other amount due in respect of any damage arising from an accident, loss or damage is payable at the time of reporting the event and not at the completion of the rental period. c) The hirer is liable for any costs relating to the delivery of a change over vehicle as a result of an accident regardless of which party is at fault. Capricorn Campers takes no responsibility for any delay, loss, damage or injury that a hirer might experience no matter how it is caused or by whom. These conditions cannot be varied or altered or waived by any employee or representative of Capricorn Campers or by anyone providing services or facilities. Capricorn Campers cannot be bound by any representative or statement unless it is confirmed in writing by Capricorn Campers’ management. Capricorn Campers are contactable on 0044 (0) 1692 538948 throughout the rental period. All faults, damage or complaints must be reported immediately on this number or at the latest on return of the vehicle. In the event that a complaint is not satisfactorily resolved upon return, the hirer must inform Capricorn Campers in writing within 14 working days. The information that you have provided to Capricorn Campers will be used to fulfill this contract placed with us. We will not pass this information onto any other organisation outside Capricorn Campers other than to our insurer.